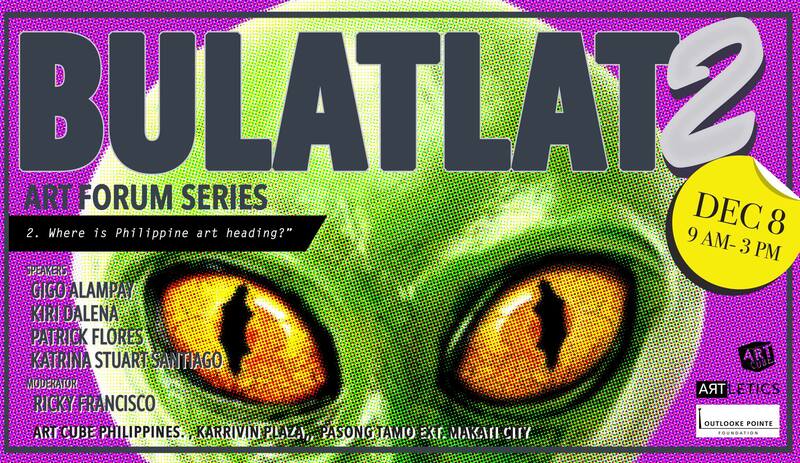 Artletics Inc in partnership with Art Cube Philippines and Outlooke Pointe Foundation invites everyone to the second installment of the Bulatlat forum series on December 8, 2018 at the Art Cube Gallery, Karrivin Plaza, 2316 Chino Roces Avenue, Makati. The forum-workshop on the topic “Where is Philippine Art Heading?” starts at 9 o’clock in the morning and will end at 3 o’clock in the afternoon. For Bulatlat 2, CANVAS director Gigo Alampay, Singapore Biennale 2019 artistic director Dr. Patrick Flores, visual artist-filmmaker Kiri Dalena of RESBAK Artists and writer-art critic-blogger Katrina Stuart Santiago will share about their current projects and advocacies and how it relates to the forum topic. Museum and gallery consultant Ricky Francisco will moderate the forum and the ensuing plenary-workshop where common creative trajectories and advocacies will be mapped. The forum is part of Bulatlat: Paghahanap-linaw sa mga isyu ng Sining, Kultura, at Lipunan, a 3-part fora series that seeks to involve artists, cultural workers, the academe, and institutions in meaningful discussions that encourage a critical perspective on art production and its impact on society. This project aims to initiate conversations on the role of art in cultural formation and nation building, with the intent of sparking creative projects and collaborations among members of the Philippine art community. For more details you can contact Alee at +639175263373 or email artleticscore@gmail.com.